The Fabric mobile dev suite from Twitter Inc. fares well in a new report on iOS mobile app SDK usage, beating industry heavyweights such as Google and Adobe in several categories. The ranking of the top SDKs being used in apps was published by mobile app intelligence and data company MightySignal and presented in a recent blog post titled The State of Mobile SDKs in 2016. The company measured SDK usage across six categories: analytics, monetization, app stability, marketing/engagement, payments and attribution. 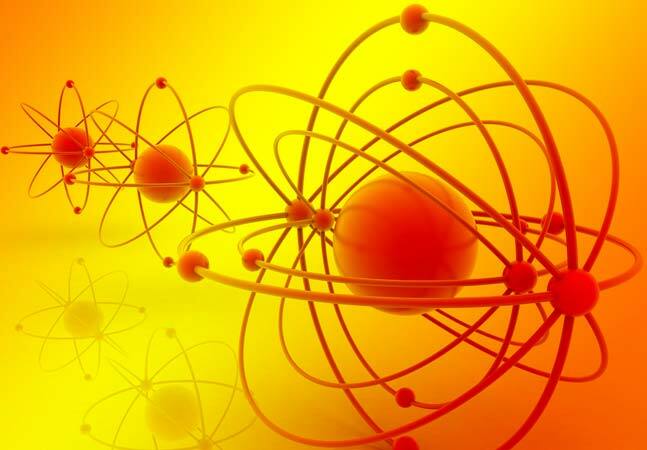 The company inspects the source code and binaries of mobile apps to glean its insights. "Currently, there are thousands of SDKs available, so developers often ask us which ones they should choose," CTO Jason Lew said in the post. "Here at MightySignal, our job is to shed light on this by providing marketing and sales intelligence on what SDKs are embedded across millions of mobile apps. "Being former mobile app developers ourselves, we wanted to give back to the developer community by sharing some of our valuable data about the top mobile SDKs." Functionality -- What does it do to my app? Market Leadership -- How many others are using it? Top Customers -- What are reputable apps that are using it? 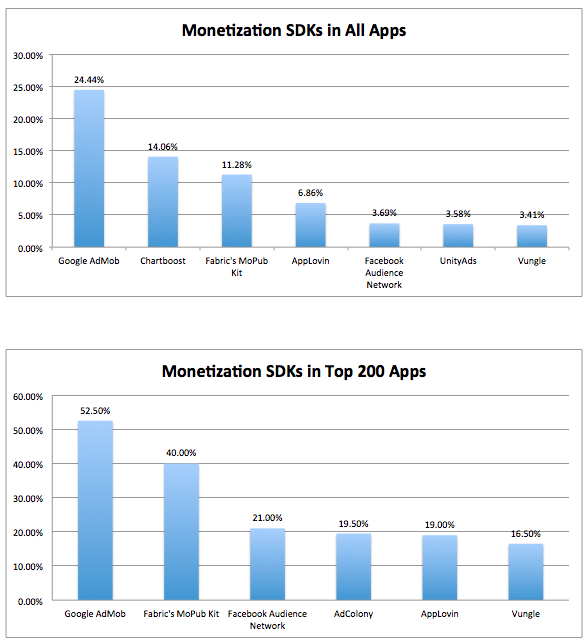 To provide that guidance, MightySignal provided data about SDK usage in all apps and correlated that data with metrics from the top 200 apps. 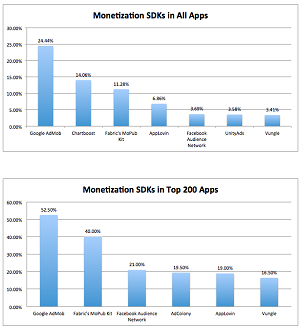 Along with Google and Adobe, SDKs included with the Fabric dev suite dominated several of these categories. Specifically, Fabric's Crashlytics kit was named the No. 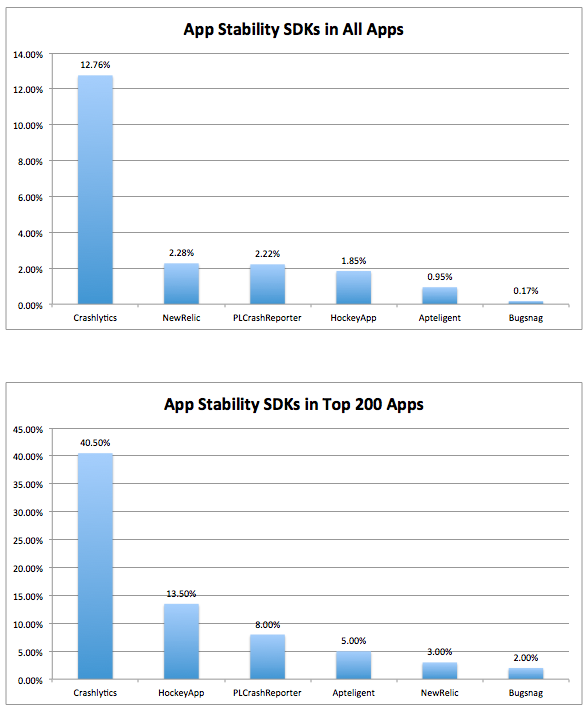 1 stability SDK in both all apps and the top 200 apps; Fabric's Answers was No. 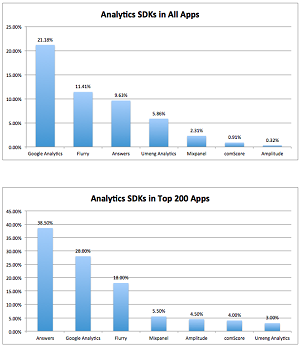 1 in analytics for the top 200 apps (Google Analytics led in the all app category, where Answers was No. 3, behind Flurry); and Fabric's MoPub kit was No. 2 in monetization in the top 200 category and No. 3 (behind Google AdMob and Chartboost) in the all app category. The blog post provides charts and commentary for each category for developers interested in seeing all the results. In a blog post, the Fabric team noted its Crashlytics kit was also named the No. 1 most implemented SDK in a report from SourceDNA, which also deemed it the No. 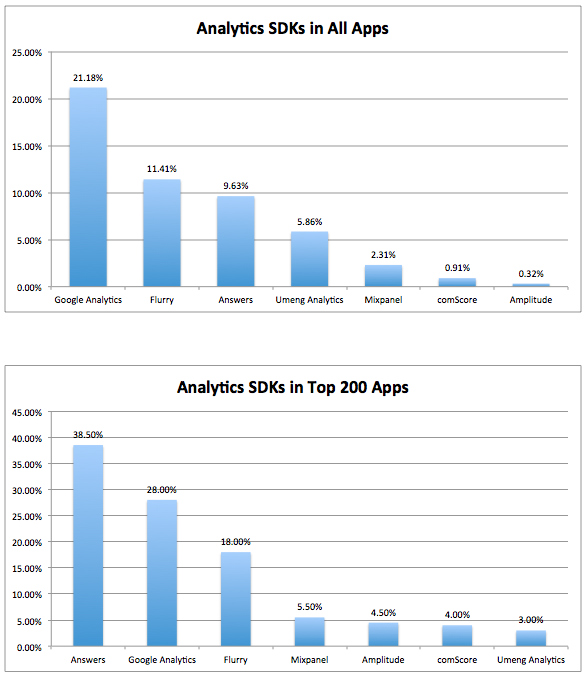 1 most implemented mobile analytics SDK on iOS. "With Fabric, we symbolicate over 1,000 crashes per second to help customers identify, prioritize and resolve stability issues that have the biggest impact on their app quality," the post said. "Last year, Fabric's Answers was distilling data from 150 billion app sessions every month to help you understand your users. Now, we're processing over 310 billion sessions every month!" Don't reinvent the wheel. Think about what your app needs to do, and do research on what free or paid SDKs are available for you. 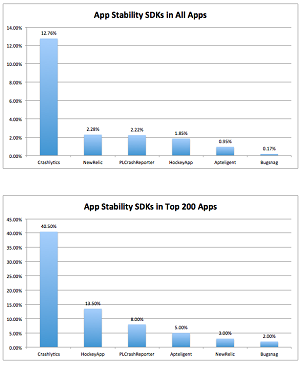 Our Most Used SDKs in Top 200 Free iOS Apps page (updated daily) can help out with this. Many SDKs actually span multiple categories. For instance, if you install Fabric, you get access to a platform that includes Answers for Analytics, MoPub for Monetization, Crashlytics for App Stability. So, look for opportunities to kill multiple birds with one stone by choosing an integrated platform that includes solutions for your top mobile challenges. If you're trying to decide between multiple SDKs with similar functionality, try them in your app first to see which you like best. Many SDKs have free pricing, so you'll be able to try out new SDKs free of cost. Use a dependency manager (Cocoapods is the go-to here for iOS, as it's used in over 1.2M apps) to manage your SDKs. 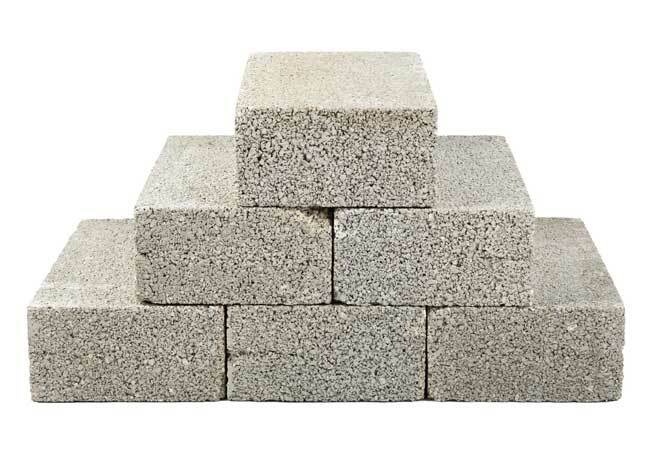 This will save you the trouble of having to manually manage SDK versioning. Open source developers, start-ups, and established companies are making new SDKs all the time. Keep an eye out for new SDKs being released because one of them may be a great fit for your app. 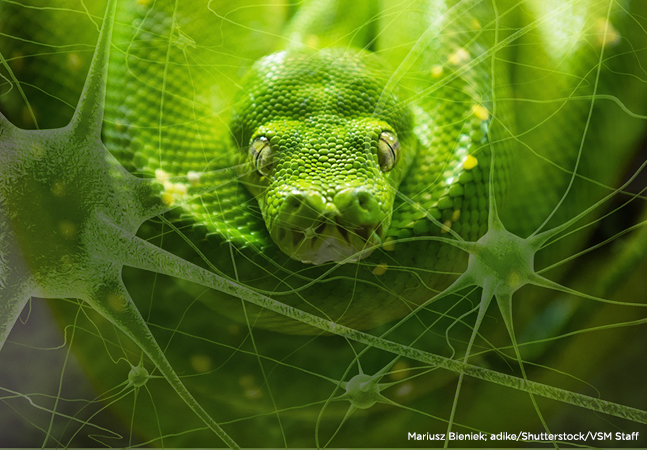 "It's very rare for a modern successful app to survive without using multiple third party SDKs, so it's necessary to be cognizant of what is out there," MightySignal said. "We want you to focus on improving your app with new functionality and features, and use SDKs to take care of the rest. 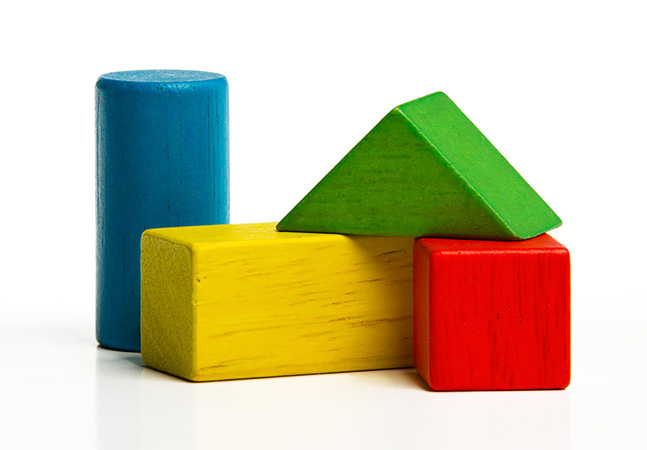 You don't have to build everything out for yourself; SDKs can step in to fill in the gaps." For more current statistics, MightySignal provides a live Top SDKs Page that's updated regularly. Also, MightySignal's iOS-centric report can be compared with a similar study from SafeDK Mobile Ltd. that detailed Android SDK usage. For more on that, see our recent article, "Android SDK Report Shows Growth of Firebase Back-End."